We believe that stabilized cell-permeating peptide therapeutics have the potential to become a major class of drugs for oncology and other diseases. Our proprietary cell-permeating peptide platform enables us to chemically stabilize and improve the performance and activity of a broad range of alpha-helical peptides that we believe may have the potential for therapeutic benefit in oncology and other diseases. Our goal is to use this technology to develop first-in-class molecules, like ALRN-6924, that may be able to address historically undruggable targets. Peptides are functional subunits of proteins that act as nature’s locks and keys and enable two proteins to interact to control cellular function. The alpha-helical structure is the most common peptide structure found at these protein interfaces. Because peptides lose their shape by unwinding when removed from their natural protein scaffold, their chemical stability and activity is greatly reduced. At Aileron, we stabilize peptides by “stapling” them with hydrocarbon bonds into their natural alpha-helical conformation. Unlike large proteins, such as monoclonal antibodies or other naturally occurring proteins, that do not penetrate cell membranes due to their size and biophysical properties, stabilized alpha-helical peptides can in many circumstances penetrate cells and still maintain high affinity to their large protein surface targets. Our cell-permeating peptides typically retain the molecular target specificity of their underlying native protein structure. Over 3,000 known protein-protein interactions are mediated by a helical peptide interface; our data and a growing body of third-party publications support the utility of cell-permeating peptides against a wide variety of targets. We believe that our cell-permeating peptide chemical strategy may allow us to improve on many of the intrinsic limitations of peptides and to develop molecules that interact with high value targets that may not be amenable to small molecules or monoclonal antibodies. Targeting p53: "Guardian of the Genome"
P53 is considered to be one of the most important tumor suppressor proteins due to its central role in preventing the initiation and progression of most solid and liquid tumors. Since its role in cancer was first described in 1979, it has become clear that inactivation of p53’s tumor suppression activity is an almost universal step in the development and progression of virtually all human cancers. Research on the function and role of the p53 mechanism has been the subject of over 75,000 scientific publications. When p53 itself is mutated or pathologically inhibited by its natural regulators, cells grow uncontrollably and may eventually form a cancerous tumor. The main function of p53 is to activate genes that will interrupt the cell cycle when DNA damage is detected. This process ensures that damaged or cancerous cells do not continue to grow and propagate. P53 normally protects cells by monitoring and controlling how quickly cells divide into new cells, repairing DNA mutations and controlling when a cell dies. 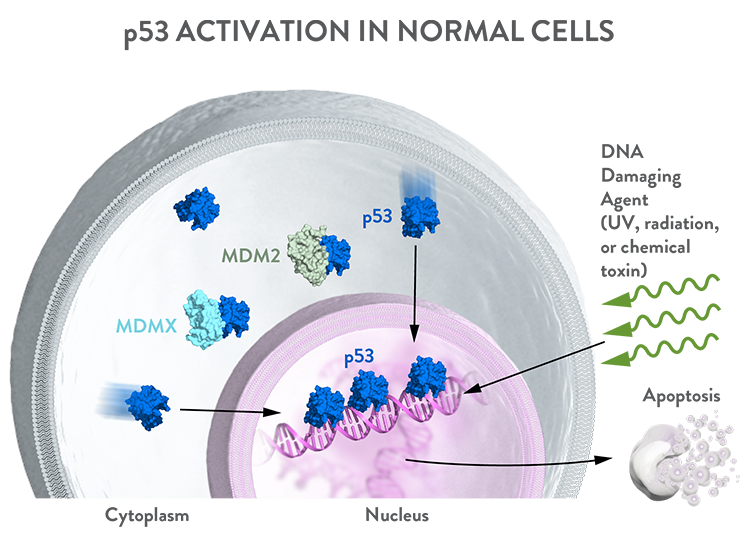 MDMX and MDM2 are two proteins known to bind to p53 and play non-redundant roles in modulating p53 protein activity. MDMX and MDM2 collectively act to suppress p53’s apoptotic activity so that cells can function as expected. Approximately half of all cancers circumvent p53 by activating or overexpressing natural suppressor proteins, primarily, MDMX and MDM2. In the remaining cancer patients, the p53 mechanism is circumvented by mutations of the p53 gene, which we refer to as mutant p53. As depicted in the figures below, p53 is regulated by MDMX and MDM2, which are two proteins known to bind to p53 and play non-redundant roles in modulating p53 protein activity. In normal cells, MDMX generally acts to sequester p53, whereas MDM2 primarily acts to shuttle p53 out of the nucleus and target it for degradation. By playing these roles, MDMX and MDM2 collectively act to suppress p53’s apoptotic activity so that cells can function as expected. In the event of DNA damage, these two suppressor proteins detach from p53 so that it is activated to respond to DNA damage. Once activated, p53 either enables the repair of the DNA damage or triggers apoptosis. This is the body’s natural response against cancer and a defense mechanism for dealing with DNA damage and maintaining normal cellular function. However, activation and overexpression of MDMX and MDM2 are found in a significant number of solid and liquid tumors that commonly present with WT p53. In these cancers, cancer cells co-opt and over-activate some of the mechanisms used by normal cells to restrain p53 function, thereby nullifying the tumor suppression capabilities of WT p53. In this environment, the cancer cell growth is left unchecked. We conducted several in vivo and in vitro studies of ALRN-6924 that informed our approach to the design of our clinical trials. ALRN-6924 bound to both MDMX and MDM2 with nanomolar affinities, indicating a high level of binding between ALRN-6924 and these proteins. ALRN-6924 demonstrated evidence of specific on-target engagement in vitro by gene expression profiling. ALRN-6924 demonstrated tumor growth suppression, p53-dependent cell cycle arrest, apoptosis and anti-tumor activity in an MDMX/MDM2- overexpressing xenograft cancer model with clear correlation to on-target PK and pharmacodynamic activity. In vivo, ALRN-6924 demonstrated potential for efficacy in both solid and liquid tumors. Our preclinical data and recent published data indicate that there may be synergy between p53-reactivating therapy and different anti-cancer agents, such as targeted therapies and chemotherapy. In addition to our AML/MDS combination study, we may also conduct additional clinical trials of ALRN-6924 in combination with other anti-cancer agents. We believe the mechanism of action and safety profile of ALRN-6924 may provide the potential for its combination with conventional and novel therapies. Some of our studies combining ALRN-6924 with other anti-cancer agents have shown the potential benefits of combination therapy. In in vitro testing, we have investigated the combination of more than 20 drugs with ALRN-6924, including drugs that target a variety of pathways mediated by p53, including MAPK, mTOR and CDK4/6 inhibitors, and traditional chemotherapeutic agents. The results indicate that almost all of the selected drugs are additive or synergistic with ALRN-6924 in vitro, with the exception of dexamethasone, which was expected to have no effect on ALRN-6924 activity. To date, no antagonism of any tested drugs with ALRN-6924 was found. Our integrated understanding of peptide chemistry and molecular biology as it relates to the physiological functions of stabilized and cell-permeating peptides forms the basis of our ability to generate novel product candidates. We seek to rationally design sequences of amino acids and stabilize them with hydrocarbon bonds that maintain their natural alpha-helical shape. The broad potential of maintaining the alpha helix is derived from the fact that it is the most common protein structure at the interface of protein-protein interactions and, as exploited by our stabilized cell-permeating alpha-helical peptides, is a necessary shape to retain the intended biological activity of the therapeutic molecule. Our approach is to target high value and historically undruggable intracellular and extracellular targets with this novel class of molecules. In the case of cancer, pathways that incorporate protein-protein interactions with an alpha helix, and that, therefore, may be amenable to our approach and the focus of our future research, include p53 and may include other transcription factors and signaling proteins such as Ras, Myc, ß-Catenin, the Bcl family of proteins and HIF-1 α. Importantly, while the critical role of these targets in biological processes has been known for decades, there are no approved therapeutics that directly engage these targets other than one therapeutic that inhibits Bcl-2. While the conventional approaches to modulate these significant targets have been based on small molecules, we believe that our ability to target and activate or inhibit key intrinsic cellular proteins and their functions, including p53 and apoptosis, using our proprietary stabilized cell-permeating peptides represents an important opportunity for developing novel drugs and addressing unmet medical need. Since our inception, we have created over 10,000 stabilized, cell-permeating peptides against multiple targets in a variety of therapeutic areas. We believe that a number of these molecules and targets warrant further study and development and could, in the future, contribute to a pipeline of novel therapeutics. Subject to our resources, it is our intention to make selective investments into some of these early research programs as part of our ongoing research. Where we believe it will be beneficial to the success of the program, we also expect to seek academic and industry collaborations to advance this work. Funda Meric-Bernstam, Mansoor N. Saleh, Jeffrey R. Infante, Sanjay Goel, Gerald Steven Falchook, Geoffrey Shapiro, Ki Y Chung, Robert Martin Conry, David S. Hong, Judy Sing-Zan Wang, Ulrich Steidl, Loren D. Walensky, Vincent Guerlavais, Marie Payton, D. Allen Annis, Manuel Aivado, and Manish R. Patel. Phase I trial of a novel stapled peptide ALRN-6924 disrupting MDMX- and MDM2-mediated inhibition of WT p53 in patients with solid tumors and lymphomas. J of Clin Oncol. 35:15_suppl, 2505-2505 (2017). Chang, Y.S., Graves, B., Guerlavais, V., Tovar, C., Packman, K., To, K. -H., Olson, K. A., Kesavan, K., Gangurde, P., Mukherjee, A., Baker, T., Darlak, K., Elkin, C., Filipovic, Z., Qureshi, F. Z., Cai, H., Berry, P., Feyfant, E., Shi, X. E., Horstick, J., Annis, D. A., Manning, A. M., Fotouhi, N., Nash, H., Vassilev, L. T. & Sawyer, T. K. Stapled α−helical peptide drug development: A potent dual inhibitor of MDM2 and MDMX for p53-dependent cancer therapy. Proc Natl Acad Sci USA. doi:10.1073/pnas.1303002110 (2013). LaBelle, J. L., Katz, S. G., Bird, G. H., Gavathiotis, E., Stewart, M. L., Lawrence, C., Fisher, J. K., Godes, M., Pitter, K., Kung, A. L., & Walensky, L.D. A stapled BIM peptide overcomes apoptotic resistance in hematologic cancers. J Clin Invest. doi:10.1172/JCI46231 (2012). Bernal, F., Wade, M., Godes, M., Davis, T. N., Whitehead, D. G., Kung, A. L., Wahl, G.M. & Walensky, L. D. A stapled p53 helix overcomes HDMX-mediated suppression of p53. Cancer Cell. 18, 411-422 (2010). Link to Research Highlight in Nature Reviews Drug Discovery. Bird, G. H. et al. Hydrocarbon double-stapling remedies the proteolytic instability of a lengthy peptide therapeutic. Proc. Natl. Acad. Sci. USA 107, 14093-14098 (2010). Walensky, L. D., Kung, A. L., Escher, I., Malia, T.J., Barbuto, S., Wright, R. D., Wagner, G., Verdine, G. L. & Korsmeyer, S. J. Activation of apoptosis in vivo by a hydrocarbon-stapled BH3 helix. Science. 305, 1466-1470 (2004). Crunkhorn, S. Stapled peptide reactivates p53. Nat. Rev. Drug Discov. 12, 741 (2013). Jochim, A. L & Arora, P. S. Systematic analysis of helical protein interfaces reveals targets for synthetic inhibitors. ACS Chem. Biol. 5, 919-923 (2010). Saladin, P. M., Zhang, B. D. & Reichert, J. M. Current trends in the clinical development of peptide therapeutics IDrugs. 12, 779-784 (2009). Nestor, J. J. Jr., The medicinal chemistry of peptides. Curr. Med. Chem. 16, 4399-4418 (2009). Bird, G. H., Bernal, F., Pitter, K. & Walensky, L. D. Synthesis and biophysical characterization of stabilized alpha-helices of BCL-2 domains. Methods Enzymol. 446, 369-386 (2008). Henchey, L. K., Jochim, A. L. & Arora, P. S. Contemporary strategies for the stabilization of peptides in the alpha-helical conformation. Current Opin. Chem. Biol. 12, 692-697 (2008). Principles of protein-protein interactions: What are the preferred ways for proteins to interact? Keskin, Z., Gursoy, A., Ma, B. & Nussinov, R. Principles of protein-protein interactions: What are the preferred ways for proteins to interact? Chem. Rev. 108, 1225–1244 (2008). Verdine, G. L. & Walensky, L. D. The challenge of drugging undruggable targets in cancer: lessons learned from targeting BCL-2 family members. Clin. Cancer Res. 13, 7264-7270 (2007).